Acosta asked Trump if he thought he had demonized immigrants in the closing days of his campaign, but Trump responded he wanted immigrants to come in legally as the two frequent sparring partners spoke over each other. Acosta brought up the Trump ad that his network and others, including Fox News, refused to air as racist; it tied an illegal immigrant murderer to the caravan and warned of a Democratic takeover. "Do you think they were actors? … I think you should let me run the country, and you run CNN," Trump said. Trump wanted to move onto another reporter, but Acosta wouldn't give up the microphone when an aide sought to tug it away from him. He sought to ask a question about the Russia investigation, but Trump said he didn't have any worry about the "hoax" and told him to put down the microphone. "CNN should be ashamed of itself having you working for them," Trump said to Acosta. "You are a rude, terrible person. You shouldn't be working for CNN. You are a very rude person. The way you treat Sarah Huckabee [Sanders] is horrible." 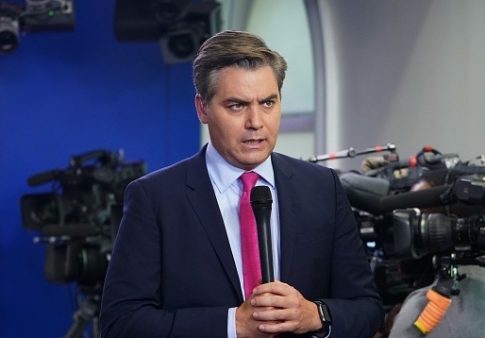 CNN's communications team responded to the exchange by condemning Trump and saying they "stand behind" Acosta and his fellow journalists around the country. Republican National Committee chairwoman Ronna McDaniel said in response that Republicans "value a free press, but it's unfortunate that some reporters seem more interested in getting their own cable show than doing their jobs." "The media grandstanding has gone overboard," she added. In addition to Acosta, Trump said he wasn't a "fan" of NBC's Peter Alexander, who during the press conference defended Acosta's behavior. Trump also told April Ryan, a CNN commentator and frequent Trump critic, to sit down down repeatedly after she stood up and interrupted another reporter, attempting to ask a question out of turn. "It is such a hostile media," Trump said. "And it is so sad that you asked me, and no, you rudely interrupted him. You rudely interrupted him." Update 4 p.m.: This piece was updated with Ronna McDaniel's response. This entry was posted in Politics and tagged Donald Trump, Jim Acosta, Media. Bookmark the permalink.